The beauty of a climate (day/hour) in which the sun is often hidden and the light is flat: I don’t have to squint. I can see more; several muscles in my face can just relax while I take in the view. It even seems to allow deeper breaths and a just a little more calm, on a travel day. Ahh, western Washington. We landed in fog, on arrival almost 2 weeks ago. Home. Not much from my childhood took up time in the long weekend away, aside from a pleasurable but too-short visit with my dad and a drive-by of my grade school campus. This visit involved several people, places and pastimes that I have discovered more recently. Mountains are there. If, when I was 15, you’d told me that at age 43 I’d be taking a trip to WA to use skinny skis, I would laugh. I may not have even heard of such things, back then. I lived to ski, downhill. Also, I may not have believed that I’d be meeting friends there who were from Minnesota, Missouri, and Virginia. Not that I thought I’d never leave Washington; I just didn’t really have an idea of what 43 would be, other than a period in which I’d be dealing with wrinkles and a mortgage payment – if we all survived the A-bomb. We went there for the mountains. The snow-capped peaks in the Pacific Northwest are powerful to me, as an element of comfort and identity. When I moved to Minnesota for college, I lamented the lack of vertical on the landscape, above the corn stalks. These mountains mean home. And yet so much from that weekend was relatively new to me. 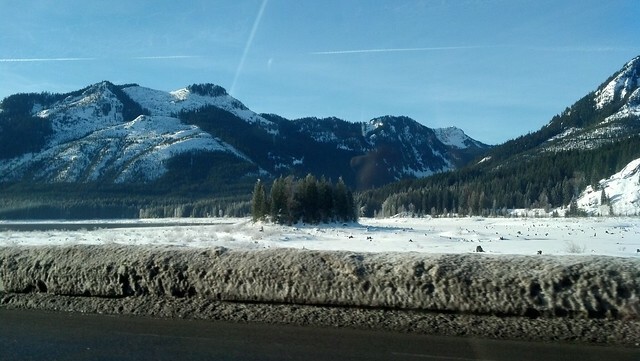 Starting with the scenery: we had a 5-hour drive from Seattle out to Winthrop/the Methow Valley, where we skied, and while I’m quite sure I’ve seen most of those roads before, I didn’t grab a book or otherwise tune out from the scenery. There was much to see, and thankfully the fog was intermittent, so we could see most of it. The nearly endless orchards of fruit trees in the Wenatchee valley managed to keep my eye and cameras engaged all the way to the cabin. I marveled at and captured the various shapes of trees, as well as the patterns the orchards created in the foreground of every view. Also new was spending most of the weekend in near proximity to a 4-month old baby. Through some strange shake of fate, my life has afforded me very little exposure to wee humans. This little girl was adorable and fascinating, and she made the ski trip even better than last year’s, which aside from the baby, involved the same group of people. That wee one likely had much to do with this: we did markedly less skiing than last year. This was my plan (at least for my own ski hours), partly due to my heel injury – but I figured I’d be the only one back at the cabin, knitting and reading away. This wasn’t what happened. Barring time spent by one or the other parent with the baby at the chalet or off on snowshoe trails, we all skied pretty much the same amount as each other. However, as tends to happen with young kids around (I know this much), things just took longer to happen. Waking up, breaking fast, preparing to ski or snowshoe, unwinding after those activities, preparing dinner, eating lunch and dinners, preparing for bed all took just a little longer. We still managed to fit in some hot tubbing and gaming (new to us, this year: Ticket To Ride, Europe version. What fun!). I really didn’t notice anything taking longer- other than when I was suddenly tired and it was midnight. Yes, I was blissfully oblivious to great efforts by new parents –but kudos to Todd, Amy and baby for being such awesome cabin mates. Also new this time in Washington: a visit to Leavenworth, on our way back to Seattle. I realized I’d never been there, though I thought I had seen it, as a kid. That must have been some gas oasis/truck stop out near North Bend with a Bavarian theme. Leavenworth was much bigger, and fantastic, and this was on a “normal” weekend. Imagine you’re in one of those Christmastime miniature villages, one styled like southern Germany, complete with tons of colorful details painted onto most buildings, a fair dose of lederhosen (even if just on figurines in windows), as well as some recorded accordion music bouncing in the air as you stroll from storefront to storefront. Also stunning was the natural scenery: we looked down (southwest) into one of the valleys that bookended the village, to see it filled with a cornflower blue fog. 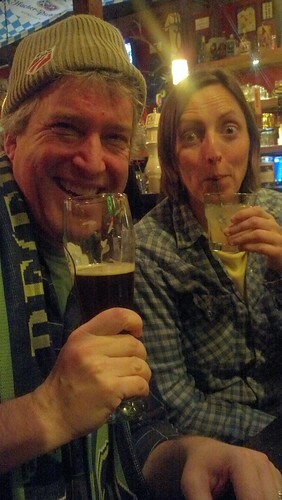 We got a semi-Bavarian lunch at Gustav’s (well, my dunkelweizen was German), checked out a few stores (I found some treats at Schocolat), then continued on our merry way, toward dinner in Seattle. The last item of new: dinner that evening with our friend Susan, at Prost! in West Seattle. It shouldn’t be all that surprising that we went to a restaurant that was newer than my 43 years – but this German spot was a great find. As a half-German American, I’ll be the last to say that I don’t like German food, but often I’m just not craving heavy food, or pickled herring. This meal was both fun (thanks to the great visit with Susan), and almost lightweight. 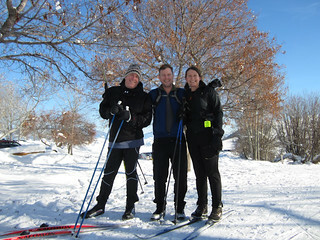 It was downright magical: maybe we pre-burned plenty of calories in the prior three day of skiing. Maybe my brat was magic. Maybe skipping the bun is the key. Or, just perhaps, I just hadn’t been to the right kind of German restaurants, even though one of our local ones, Gasthof, serves a hell of a good Schweinshaxe. Of course, the visit to my actual hometown afforded a terrific breakfast with Dad at the grill on the new (see, “new” snuck up on me again) Chambers Bay Golf Course. Normally there’s a spectacular view from this spot, but the weekend’s air soup (fog) came right up to the windows: no Puget Sound view for us, at that hour. That was just fine with me: my meal of “Crème brulèe battered Corina Bakery cinnamon swirled brioche loaf French toast” had the few parts of my attention that Dad and Steve did not command. What a great way to start a day of traveling back to the bitterly cold, snow-lacking earth of Minnesota. Also, right at the start of the trip was the Virginia contingent: A visit with friends from the DC area; friends old and new, depending on who you’re asking … and at a restaurant that was new to all of us. So, a trip to a place of comfort, which afforded much new adventure. 2013 is off to a great start! Thomas Wolfe had it right: life changes you; time passes. You may not be able to “go home again,” but I think home can remain in your heart, and still allow for surprise and discovery. Do you agree, think otherwise? Let me know in the comments. I’d love to hear your “home” story.